A Royal Australian Air Force Orion has been scrapped and two more are scheduled for disposal by the end of 2014, Defence has confirmed. The first aircraft, A9-663, which was the only aircraft in the RAAF’s 19-strong Orion fleet not upgraded under the AP-3C program, was scrapped on October 20. All 19 Orions are due to be progressively drawn-down through to June 2019. The Orion’s maritime intelligence, surveillance and reconnaissance (ISR) capability is scheduled to be replaced by a mix of manned P-8A Poseidons and unmanned Northrop Grumman MQ-4C Tritons under the AIR 7000 program. Any idea what’s happening to the aircraft not being cut up? Sold maybe? What about State Governments be forward thinking & purchase the best airframes & convert them to firebombers? The Queensland Air Museum would love to acquire one to “preserve our nation’s aviation heritage”. The disposal of the aircraft will be subject to the conditions of the original FMS case with the Yanks. In a nutshell they will dictate who the ADF can transfer the aircraft to, or how and where they are scrapped.This is why the surviving F111 are only on “loan” to museums and under strict control. It is why HMAS Manoora and Kanimbla were towed all the way to Texas to be scrapped, and not reduced in India. It is why the three DDG (HMAS Perth, Hobart & Brisbane) were scuttled and not scrapped. Some P3s may be preserved in museums, but I reckon the chances of them becoming aerial bombers will be slim. I thought the P-3Cs had ongoing corrosion problems for years ( apparently the previous P-3Bs did not ) . And why exactly do we need to worry about New Zealand’s defences – they didn’t seem to have a problem eliminating their A-4 , MB 329 squadrons a few years ago did they? NZ don’t need anymore P3s I am sure these aircraft are worth more in spare parts than the whole of the airframe. The parts will keep the rest of the fleet in the air. Just like old airliners the engines are the most attractive part of the airframe. I agree with Andy, I think the unscraped p-3 will be sent to museums. The Rnzaf would upgrade them to p-3k2 to keep them flying for another 10 years or so. National aerial firefighting centre provides sufficient and up to date firefighti g aircraft – the cost of converting the pld P-3s, while romantic, would not be cost effective. Don’t know if they would be of interest to the RNZAF or the NZG. Think the current NZG may have learned the lessons of buying cheap second hand well used gear being a false economy with a very expensive sting in the tail. 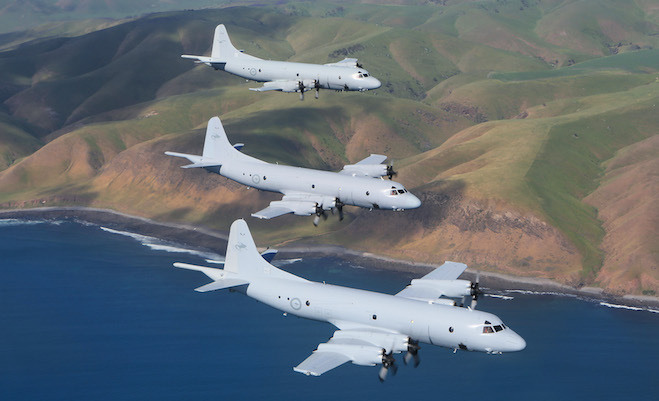 The RNZAF are in process of undertaking a Future Air Surveillance Project which is the P3K2 Orion replacement project. That was announced by DCAF in the latest Air Force News (October 2014). I’m not sure the P-3 would fall under the same security requirments as the F-111 as the P-3 isn’t a nuclear weapon capable platform. William the P3 is a nuclear capable platform. I thought the FMS restrictions (in a practical sense at least) had more to do with their parts than their weapons capability. IIRC the old Aus Army Iriquois were also subject to FMS. Essentially one of the things the FMS prevents is old airframes being sold to ‘unfriendlies’ (maybe through a few sets of hands) whereby parts can be used to support those unfriendlies own airframes (often a different type but using common components). Agreed Damian. The C-130H’s being gifted to Indonesia have been ‘demilitarised” so they are no different to any other aircraft, right down to the paint system. If we were to sell them, it would be under guidance and approval from the US State Department we would only be able to sell them to approved countries and with all the fruit removed, basically just air frame, engines and avionics. What’s the bet HARS will be ear marked for one. It seems from having worked briefly in defence; most US built equipment is subject to ITAR regulations – meaning the US has final say as to how Australian owned military equipment [ex- USA] is disposed of., which is why most of the F-111’s were buried , and other examples of disposal are noted in comments. The P2V7 we obtained for the 14 Wing Greenwood museum from USN was under similar strict rules for a few years then obsolescence and bureaucratic attention dwindled. I am sure the F111 situation will be similar. As the Display Manager at the Australian National Aviation Museum, we have expressed interest in acquiring a AP-3C Orion. Not only has/is the AP-3C version one of the best at its operational requirements, the aircraft has served the R.A.A.F and the A.D.F with pride. There is a need for a few to be preserved as a tribute to the Men and Women who flew, maintained and were involved in this wonderful aircraft.